A creative staff development workshop with the designers of Dobble Debate, Nina Czegledy and Dr Lynne Heller from Ontario College of Art and Design University, Toronto. This workshop will induct you into the Dobble Debate game and provide inspiration for how to use gamification to support engagement within the classroom. It will increase your knowledge of differing and dis-abilities, how perceptions of ability can change in relation to context, peer-discussion, humour and co-creativity. This workshop is open to all but will be particularly useful for individuals with an interest in disability, gamification and those involved in student engagement with social issues and/or co-creative design. Coventry University staff can book a place via the Organisation Development portal. If you are not a Coventry University staff member, to book a place please email: dmll@coventry.ac.uk. Dobble Debate is an umbrella project that uses games, humour and imagination to promote discussion and education about dis- and differing abilities. One aspect of the project is an analogue card game which is played with cards and debate. It is intended to be amusing leading to laughter as players try to make up winning arguments for why a particular ‘disability’ would be a disaster or a real advantage in any given circumstances. The goal is that players still come away with the feeling that any differing ability might be an advantage at times. Furthermore, because the overall experience of the game is light-hearted and imaginative, players are left associating ‘disabilities’ with a positive feeling. The game requires that players learn about the specifics of differing abilities. In this workshop we will introduce the project in more detail and then engage in co-designing with participants to discover different approaches to our existing analogue card game as well as exploring future digital possibilities. The project has been generously supported by the Social Sciences and Humanities Research Council, Government of Canada. 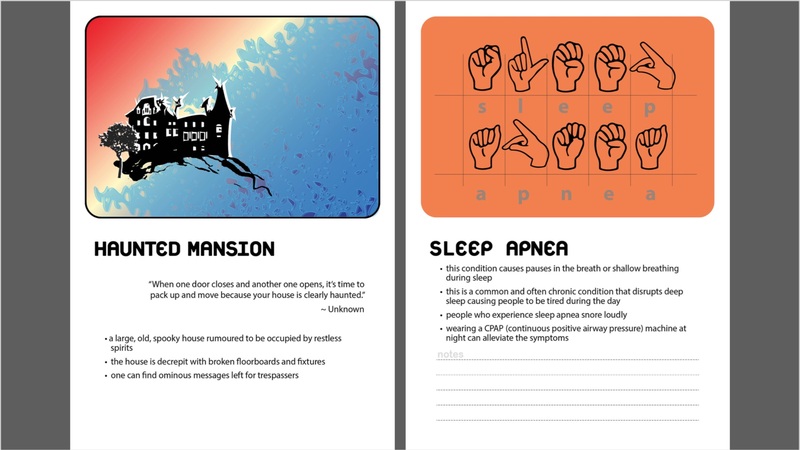 The initial game developed for this project is intended for use in schools with students who do not have direct experience of differing abilities. Following this, the game could be used by people or groups with differing abilities for feedback that would contribute to a new revised game for future outreach. The game promotes, through its iterative and narrative methodology, understanding, cross-fertilization, knowledge mobility and community. To use research-creation and co-creation to create games and experiences that exemplifies these ambitions. Lynne Heller is a post-disciplinary artist, designer, educator and academic. Her interests encompass both material and virtual culture, performance, graphic novels and sculptural installation. Heller completed her MFA at the School of the Art Institute of Chicago in 2004 and her PhD in 2016 at University College Dublin, Ireland from the department of Gender, Culture and Identity in the School of Humanities and Arts, with a research focus on feminist practice in online culture. Her research was practice-based, with a specialty in Digital Media Arts. She is an Adjunct Professor at OCAD University, as well as co-director of the Data Materialization Studio and Reviews Editor of Virtual Creativity, Intellect Publishing. She is also an adjunct faculty member of SMARTlab, Ireland. Nina Czegledy is an independent media artist, curator, and writer with international and national academic affiliations. Czegledy is based in Toronto and collaborates on art& science& technology projects in Canada and abroad. The paradigm shifts in the arts in a cross-cultural context, interdisciplinary education and practice, inter-generational involvements inform her collaborations. Czegledy -originally from a science background- has curated many international interdisciplinary art & sci & tech exhibitions and thematically connected conferences. Czegledy worked on various phases of Dobble Debate since 2013. Her latest curatorial projects include Leonardo 50th at Cyber Arts, ARS Electronica, Austria, 2018, SPLICE, Re-examining Nature (Oulu Art Museum, Finland 2017). Currently she is working on the Green (working title) 2020, for The Museum, Kitchener, Ontario and Senses (2019-2021) for the Laznia Contemporary Art Centre Gdansk, Poland. She has participated in international forums, workshops, and festivals. On behalf of Leonardo/ISAST she initiated and co-presented 27 Leonardo 50th Celebrations in 24 countries in 2017 and 2018. Her academic lectures lead to numerous publications in books and journals. Adjunct Professor, Ontario College of Art and Design University; Research Fellow, KMDI/ Semaphore Research Cluster University of Toronto; Research Collaborator, Hexagram International Network for Research-Creation in Media, Montreal; Senior Fellow Hungarian University of Fine Arts, Budapest; Member of the Governing Board Leonardo/ISAST; Member, Leonardo LASER Chairs; Board Member, Noema Scientific Committee, Bologna Italy; Chair Intercreate org New Zealand.